Win tickets to see Thriller Live at the Lyric Theatre in Londons West End courtesy of BGO Bingo. T&C’s apply. Click for more details. Join in The BIG Competition promotion at BGO Bingo to win cash & prizes in 3 special end of the month games. Click here for all the details T&C’s apply. This month you can win superb prizes by joining in the Boss’s Mad March Offer games at BGO Bingo in the Golden Galaxy Room at 8:30 pm on Monday, Wednesday and Fridays. T&C’s apply. To help get you in the festive mood there are £4,000 of Christmas Jackpots at Tasty Bingo! Play for BIG cash prizes and goodies too in these seasonal games! 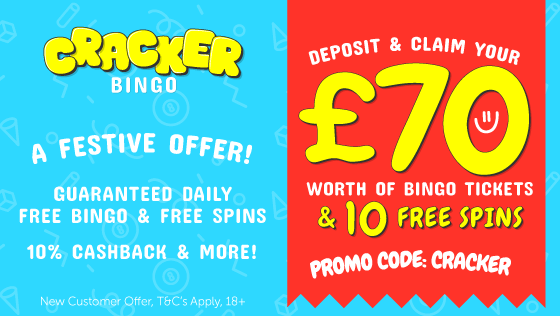 Join in the £20,000 Christmas Giveaway at New Look Bingo. Play for the chance to win fabulous cash prizes. Join today and get £15 FREE no deposit needed!